can be delivered to patients in the community with CFS/ME'. nonpharmacologic treatment: explanation and elaboration. Ann Intern Med. Out with "review", in with "preview"
conclusions (AFTER you've spent a million quid of precious funding!). It is a principle that this Research Psychologist and veteran M.E. outcome of the work itself. I write this as a patient with ME. criteria used to diagnose ME. patients with ME, some patients do not believe psychologists with ME. narrow range of opinions on CFS published in the medical literature . payers who are spending millions of pounds on suboptimal treatment. 2. Farmer A, Jones I, Hillier J, Llewelyn M, Borysiewicz L, Smith A.
function. Cellular Immunol 252; 16-26. Re: Re: How fine do you have to get ? be allowed to go unchallenged. t for Work and Pensions (DWP) has ever funded." ,at least, have proved how true that is. Syndrome. Arch Phys Med Rehab 1999:80:1090-1094). guidelines for research. JRSM 1991:84:118-121). Re: How fine do you have to get ? evaluated for use in research. minimal exertion and a delay in recovery of muscle power . fluctuation in symptoms is a major criterion for ME but not CFS. fatigue states. 2nd ed. London: Gower Medical Publishing. How fine do you have to get ? people probably had ME and the other 14% did not. (5000 + published papers)multi-system physical dysfunction. percentage they have now arrived at. only comes up with at best a "clinically modest " result. help people with ME ? ME, because it denies the physical truth ? maintained at one year follow up (70 weeks), our primary outcome point. [-1.90, 2.63], SE 1.15, P=0.752. in primary care with chronic fatigue syndrome: study protocol. Figure 1 Mean scores on the Chalder et al fatigue scale, scored 0123, at baseline(week 0), after treatment (week 20), and at one year follow-up (week 70) for patients allocated to the three treatment arms. 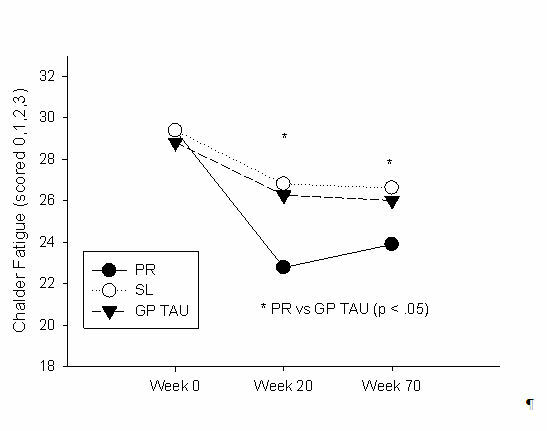 *Significant difference between PR and GPTAU. GPTAU, general practitioner treatment as usual; PR, pragmatic rehabilitation; SL, supportive listening. Christopher Dowrick, Carolyn Chew-Graham, Richard P Bentall, Richard K Morriss, Sarah Peters, Lisa Riste, Gerry Richardson, Karina Lovell, and Graham Dunn. seriously. Surely anything that might help deserves investigation?" research into any other factors causing, maintaining or exacerbating MS.
do not have MS at all, but who might benefit from a regime of exercise. Does the proposition still sound so sensible? that a diet rich in fruit and nuts is beneficial to general health. allergy. Most of the definitions of ME/CFS include "exercise intolerance"
as one of it prime characteristics. the patients were not trying hard enough. Would they say that to those with cancer, MS or HIV/AIDS?